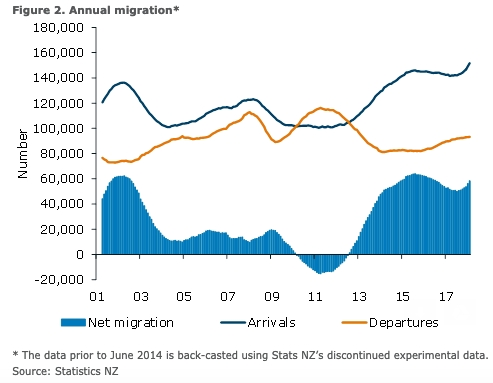 New Zealand’s net migration appears to have levelled off over 2018. But the data remains noisy and suggests inflows surged higher over the past two months, though these outturns are likely to be subsequently revised, according to the latest report from ANZ Research. Statistics NZ travel and migration data remains noisy, following last year’s change to the outcomes-based collection methodology. This new method of data collection is subject to a lot of uncertainty, reflecting difficulty in allocating travellers as short- or long-term visitors. The data are volatile and subject to large revisions, especially the most recent six months of outturns. Today’s release suggests that net permanent and long-term migration levelled off over 2018, and perhaps surged higher in the past few months. By contrast, in December, the data showed migration fairly flat. In November, the data showed net permanent and long‑term migration trending down over 2018, the report added. According to the latest release, seasonally adjusted monthly inflows rose a modest 6,300 in January, with a strong influx of arrivals. December’s print was revised from 5,080 to 6,880, reflecting lower departures than previously published. This implies that inflows have been sitting at around 6,100 on average over the past three months, compared with an average of 4,800 over the past 12 months. Annual net inflows have ticked higher to 58,400. Overall, net permanent and long-term migration has been trending down since its peak of 64,000 in 2016. Under the previous intentions-based methodology, the migration cycle was thought to have peaked at 72,400 in July 2017. Recent data poses some risk that the declining trend has reached its end in recent months, but we expect this picture may change as more data comes in. Meanwhile, short-term arrivals of overseas visitors remain at a high level, although they reportedly dipped by 450 people in January. There have been 3.87 million visitors over the past year (up from 3.86 million in December), providing support to the tourism industry, which is grappling with capacity constraints, ANZ Research further noted.